The students will learn about community building through a shared eating and cleaning experience. Students will then reflect and write about their shared experience. Since they eat on the floor, they have eating mats (included in the artifact box). They are made from straw so there is easy cleaning and storage. Lay down mat, then bowl goes in center of mat. 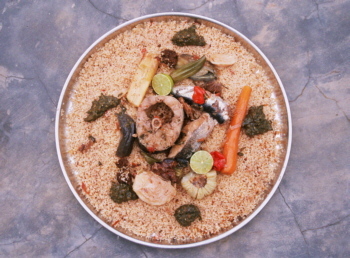 Traditionally, Senegalese people do not eat with silverware. They use their hands. To be more accurate, they only eat with their right hand. The left hand is considered unclean, because it is used for restroom purposes. So it is most useful and non-offensive for Western world people to actually sit on their left hand to refrain from using accidentally during a meal. Another important characteristic of eating around the bowl is that it is done silently. This is for the sake of the young children, who could choke on a piece of rice if talking while eating. This way, you must pay attention to the facial gestures and body language of the others around the bowl with you in order to communicate. So before you step onto the mat to eat, you must remove your shoes, out of respect and cleanliness. Then sit cross-legged around the bowl. Visualize that the bowl is a pie. You only eat from the slice of pie right in front of you. It's considered very rude to reach across to someone else's slice. This is why all the meat and vegetables are placed in the center of the bowl. The oldest person breaks up the meat or prized vegetables and places some in front of each person. The youngest person stabilizes the bowl. If there is something else you want to eat in the center, you break off a piece and take it back to your area, not pulling the whole carrot to you. You wouldn't be so selfish to take it all, especially considering other people eat after you. So use your right hand only to take a small handful of rice and vegetables. Roll it into a ball with your hand (this will take some practice). Then pop it in your mouth. Finish your chewing and swallowing before you reach for more, as not to appear greedy. When you are done, simply clean up the area around you and your slice, pushing the stray rice in the bowl back down with the rest of the food. Then get up and go to the hand-washing bowl and kettle. The hand-washing bowl and kettle are included in the artifact box. Fill the kettle with room temperature water and place a bar of soap on the side of the bowl. The water is poured over the washer's hands and into the bowl. You cannot simultaneously pour and wash your hands at the same time. A friend must pour the water for you. (One cannot wash one's hands without the help of the community.) You would then pour for the person after you in line. Discussion time. Typically Senegalese people drink tea and converse after dinner. This is entirely optional for the classroom. Here are some sample discussion questions. Have students answer individually, in small groups, orally or in writing. How did it feel to get sloppy with other people? Were you able to share a laugh, a glance, a smile with someone while eating? How do you think this breaks barriers between people? What if you ate this with a friend you had just had a fight with? How would this experience change your relationship with your annoying neighbor, your little brother, your ex-friend? And what did you feel during the hand-washing experience? How did it feel to be dependent on someone else? To work with someone else? To be of service to someone else? These are the daily activities that act as the glue to bind people together into a community. The Senegalese word for this glue is kollere .